Kumu Francis Palani Sinenci from Hana, Maui is a master builder who has led the community in numerous hale building and heiau restoration projects across Hawaii. 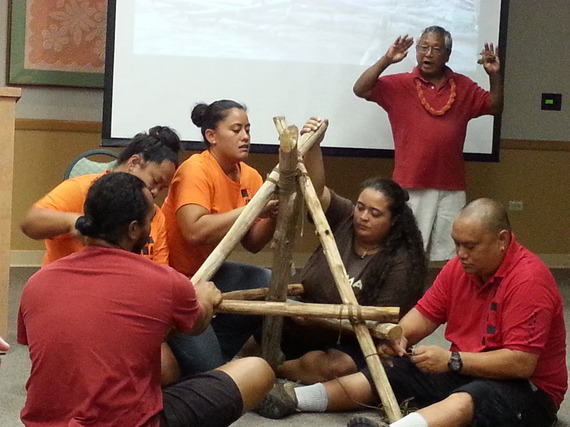 But on Thursday September 18 he was on campus at Chaminade University building understanding of Native Hawaiian culture through a "show and tell" session with several of the alaka`i (apprentices who have mastered the art) he has nurtured and trained in ancient Hawaiian building techniques. From the opening oli by Kalama Cabigon to the ha`a (warrior dance), to the guided demonstrations under Kumu Palani, this event organized by the Office of Native Hawaiian Partnerships at Chaminade University whetted the audience's appetite for more. And there will be more. 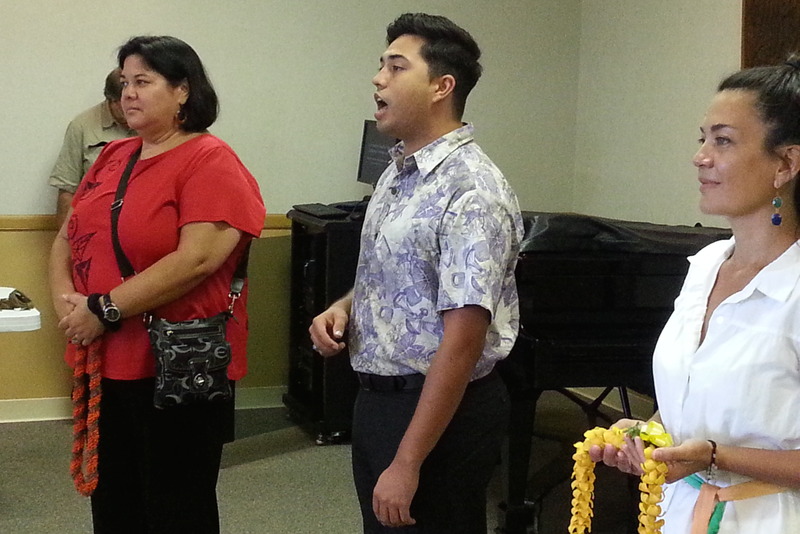 Leopoldino welcome Kumu Palani and the hale builders into Ching Auditorium. "We want people to understand that Chaminade is a place that educates the whole person. They get an education that is firmly anchored both in Marianist values of service and justice and the Hawaiian culture of community and respect for the skills and knowledge from our kupuna. Events like this one allow us as a university to support the incredible work of people like Kumu Palani who help ensure that those skills and knowledge are not lost," says Dr. RaeDeen Keahiolalo-Karasuda, Director of Chaminade's Office of Native Hawaiian Partnerships. The ha`a celebrates the value of courage and community. 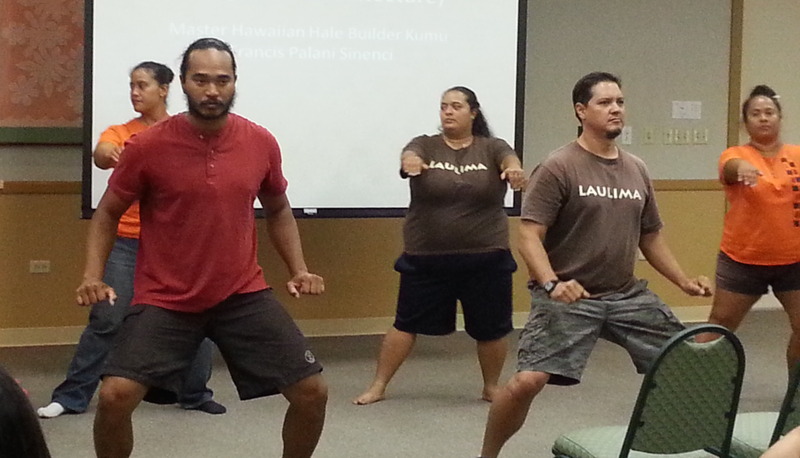 Kumu Palani provided a quick glimpse of the various kind of hale and the purposes they served. He cited the example of the hale papa`a for storage; the hale noa, free of kapu, where everyone slept; the hale pe`a for women during their menses, the hale mua for men only--the traditional Hawaiian man-cave, he joked. Alaka`i hold up their handiwork -two posts firmly lashed together. The highlight of the lunch hour talk was probably the demonstration of the strength of the olokea, the ladder system that serves as scaffolding that was built before our eyes by several of the alaka`i. Critical to the strength of the olokea was how well the posts were lashed together. Proof that the alaka`i had learned their craft was the fact that the portable olokea they lashed together was able, in Kumu Palani's words, "to support a thousand pounds of human flesh." 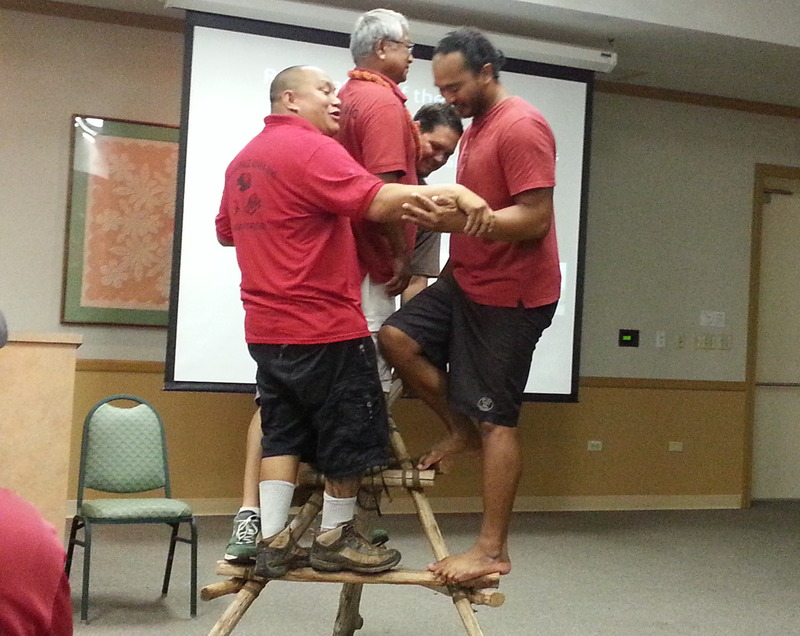 Alaka`i lash together posts under the watchful eye of Kumu Palani. Commenting on his encore career, Kumu Palani said it was the tug of history and tradition that brought him home. "After decades of service in the Navy and Air Force, I decided I was going home to build hale," said Kumu Palani. The sense of purpose in reclaiming a cultural identity once almost erased was echoed by several of the alaka`i. 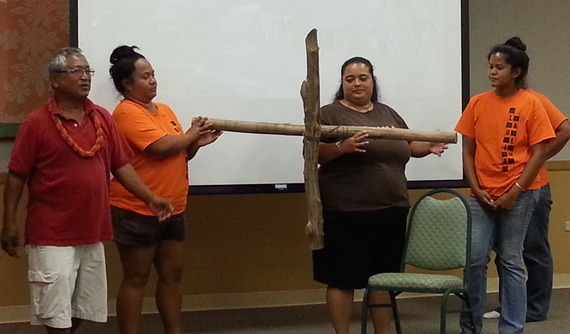 They spoke of building hale and restoring fishponds and heiau as ways of remembering the kānaka maoli's ties to the land that was taken from them. A portable olokea sturdy enough to support "a thousand pounds of human flesh." Kumu Palani's niece, Kara Nalani Henderson, one of the alaka`i at this event perhaps said it best: "Hale building is a reclamation of our past, our space. It makes us work together. This is not something we can do alone. We have to do it as a community." Karasuda closed the event with a reminder that what we had just witnessed was a story of the strength of a community when people worked together for a common purpose. We had seen the example of what a great teacher could do with students eager to learn, and the rewards that flow from the respectful recovery of a cultural legacy.